Rabbit polyclonal IGF1 Receptor (phospho Y1161) antibody. Validated in WB, IP, ELISA, IHC, ICC, ICC/IF and tested in Mouse, Rat, Human. Cited in 34 publication(s). Independently reviewed in 17 review(s). Ab39398 detects endogenous levels of IGF1 Receptor only when phosphorylated at tyrosine 1161.
ab39398 was affinity purified from rabbit antiserum by affinity chromatography using an epitope specific phosphopeptide. The antibody against non-phosphopeptide was removed by chromatography using a non-phosphopeptide corresponding to the phosphorylation site. Our Abpromise guarantee covers the use of ab39398 in the following tested applications. 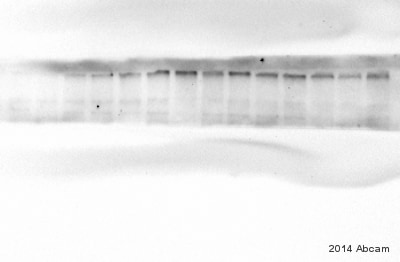 Western blot analysis using IGF1 Receptor antibody (ab39675, Lane 1, 2 and 3) and IGF1 Receptor (phospho-Tyr1161) antibody (ab39398, Lane 4 and 5). Immunocytochemistry/ Immunofluorescence - Anti-IGF1 Receptor (phospho Y1161) antibody (ab39398)This image is courtesy of an anonymous abreview. 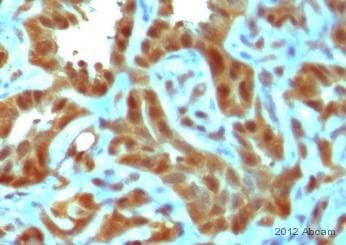 ab39398 staining IGF1 Receptor in human stomach tissue sections by Immunohistochemistry (frozen sections). Tissue was fixed with acetone and then blocked with 5% serum for 1 hour at 23°C followed by incubation with the primary antibody, at a 1/100 dilution, for 1 hour at 23°C. An undiluted HRP-conjugated goat polyclonal was used as secondary antibody. Immunocytochemistry/ Immunofluorescence - Anti-IGF1 Receptor (phospho Y1161) antibody (ab39398)Image from Bedzhov I et al., PLoS Genet. 2012;8(3):e1002609. Epub 2012 Mar 29. Fig 5.; doi:10.1371/journal.pgen.1002609; March 29, 2012, PLoS Genet 8(3): e1002609. 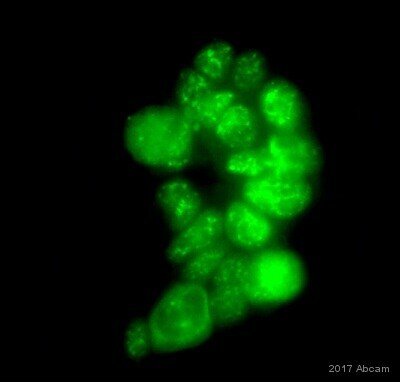 Immunofluorescence analysis of murine blastocyst, staining IGF1 Receptor (phospho Y1161) (green) with ab39398. Blastocysts were fixed with paraformaldehyde and permeabilized with 0.3% Triton X-100 for 5 minutes. Samples were incubated with primary antibody diluted in 2.5% BSA. An AlexaFluor®488-conjugated anti-rabbit IgG was used as the secondary antibody. Nuclei were stained with DAPI (blue). Immunohistochemistry (Formalin/PFA-fixed paraffin-embedded sections) - Anti-IGF1 Receptor (phospho Y1161) antibody (ab39398)This image is courtesy of an anonymous abreview. Immunohistochemistry (Formalin/PFA-fixed paraffin-embedded sections) analysis of human stomach tissue sections labeling IGF1 Receptor (phospho Y1161) with ab39398 at 1/100 dilution. The tissue was fixed with formaldehyde; heat mediated antigen retrieval was performed using a citrate buffer pH 6.0. The tissue was blocked with 5% serum for 1 hour at 23°C followed by incubation with ab39398 at 1/100 for 1 hour at 23°C. An undiluted polyclonal goat anti-rabbit HRP conjugated secondary antibody was used. 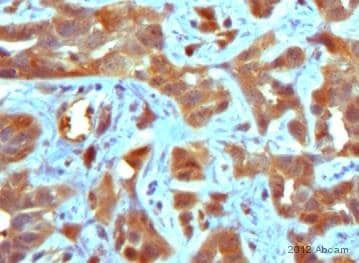 Immunohistochemical analysis of paraffin-embedded human breast carcinoma tissue using ab39398 diluted 1:50. Publishing research using ab39398? Please let us know so that we can cite the reference in this datasheet. Does the RabMAb product also cross-react with P-Tyr 1161 in the IGF receptor? I don't believe we have specifically tested for cross reactivity of ab62321 with the IGF1 receptor. However, based on the immunogen sequence, it is quite likely ab62321 will also cross react with the IGF1 receptor at P-Tyr 1161.
i order from abcam on January 2012 No thing wrong with the reagent. it's worked good. i need some assisted because i found some situation during my reaserch. i found a lots negative expression on my research. around 60% from sample. i just curious about this condition and i can not found the reason why?. i need assisted to find out this problems. may be i choose wrong Reagen? or if any condition from my sample may caused this situation? or may be there was same experiance and references about this condition. i will greatfull for any assisted from ABCAM. I am happy to hear that our products are working fine in your hands. However, I am not sure if I can help you with your current situation. If you want, I will have at least a look at your protocol for your cell culture and the ICC to see if I can spot something. Iwould like to know if it is possible to buy corresponding blocking peptid for ab39398. thank you! https://www.abcam.com/index.html?datasheet=133018 (or use the following: https://www.abcam.com/index.html?datasheet=133018). It has the product number ab133018. We are looking forward to your order and wish you good luck with your experiments.